Our color challenge at Hand Stamped Sentiments is all about saturated jewel tones. Now I could have used touches of these bold hues, but instead I went full out with lots and lots of color. I have made a pouch using the Gift Bag Punch Board and a piece of Naturally Eclectic DSP. I have seen similar pouches on Pinterest, but never found any instructions, so I did my own thing. I started with a 12" wide by 7" tall piece of DSP. 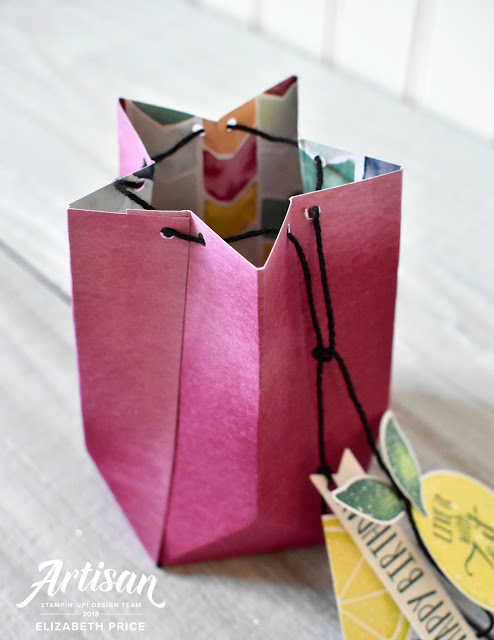 Instead of following the directions for making a bag with the punch board I repeatedly scored the triangle section on the Gift Bag Punch Board until I ran out of paper. The 12" wide paper allowed for five repetitions. 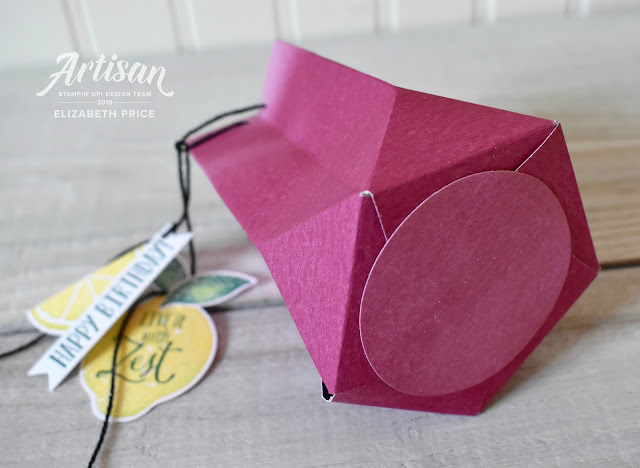 To create the triangular popped out shaping I folded opposite of the usual directions for making a gift bag. As I was punching and scoring the triangular sections I reached the end of the paper and it wasn't long enough for a sixth full section, so I trimmed it off to make a tab to connect the ends. I used Liquid Multi-Purpose Glue to adhere the two ends together. Each of the larger punched tabs were folded inward to make the pouch bottom and to secure it I used a circle to hold the shape in place. I pinched each section flat to punch holes all the way around. I ran some Solid Black Bakers Twine through all the holes to cinch it closed. 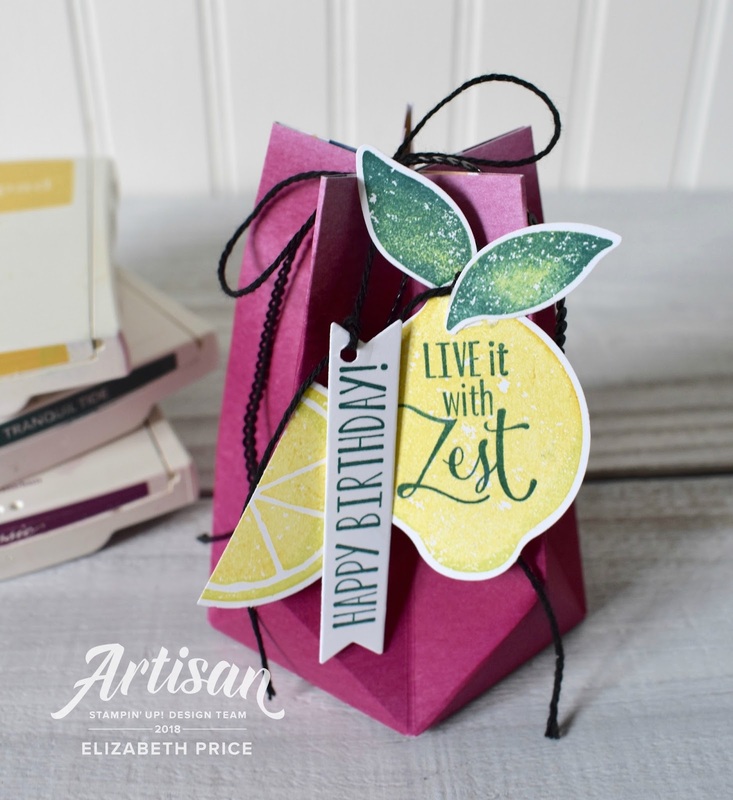 To make the tags I grabbed the Lemon Zest Stamp Set and the matching punch. 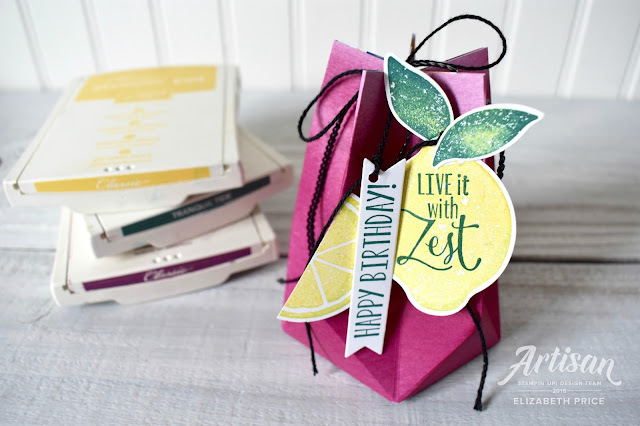 To the colors in the challenge I threw in a touch of Lemon Lime Twist.